Beginnerskoolhoofde in Suid-Afrika en in die buiteland vind dit al hoe moeiliker om aan die eise van hul werk te voldoen, hoofsaaklik vanweë ongenoegsame voorbereiding en ondersteuning. As beginners word hulle emosionele, sosiale en intellektuele intelligensie op die proef gestel. Daar word aangeneem dat tersiêre kwalifikasie- en opleidingsprogramme voldoende is om persone pasklaar as 'n skoolhoof af te lewer. Om die rede word daar van hulle verwag dat hulle in staat moet wees om die daaglikse nuwe eise en uitdagings te bowe te kom. Hierdie artikel konsentreer op mentorskap as ondersteuning vir beginnerskoolhoofde. 'n Kwalitatiewe navorsingsbenadering is gevolg. Deur doelgerigte steekproefneming is sewe skoolhoofde uit verskillende kulturele agtergronde as deelnemers geïdentifiseer. Die diskoersanalise wat daarna gevolg het, het aangedui dat beginnerskoolhoofde voel dat hulle bestuursvaardighede tekortskiet. Hulle het dit veral moeilik gevind om regskwessies, menseverhoudings, kommunikasie en departementele instruksies te bestuur. Ook het hulle laat blyk dat daar 'n gebrek aan gestruktureerde ondersteuning was, veral deurlopende ondersteuning. In South Africa, novice school principals carry an exceedingly heavy burden because of inadequate education and preparation as principals. They have not necessarily been familiarised with the demands and challenges of effective school management before their appointment, and no support in the form offormal mentorship exists for preparing them (Moorosi 2012:487). Whilst an interest in mentoring has been shown in organisations (O'Neill 2005:439), little research has been conducted into the advantages of the relationship between a mentor and a novice principal, with a view to the professional development of the latter. School principals, especially novice principals, are exposed to emotional, social and intellectual demands and challenges. Moreover, as school principal leadership has become a key factor in the improvement of schools, preparation and support are essential (Wildy & Clarke 2008:269; Wildy et al. 2010:308,309; Crawford & Cowie 2012:177). The purpose of this article is to report on an investigation into whether mentoring could support novice principals. It is important that the novice school principal's emotional intelligence (seen in self-confidence), social intelligence (evident in group management and cooperative abilities) and intellectual intelligence (seen in competencies) serve as the foundation of his/her preparation to work as school principal (Lee et al. 2013:1,2; Dwiningrum 2013:144). Unfortunately, no support is available to support the abovementioned three "pillars" during the first few years of the principal's service. Consequently, school principals are weighed down by stress, emotional, psychological and social problems (Cheung & Walker 2006:406). Recently, the focus has been on the connection between theories taught in education programmes and applied to school practice. principals, viz. the knowledge transfer theory, the social capital theory and the psychosocial theory. The principle of the first is that knowledge often takes the shape of convictions about reality (Geng et al. 2009:124). The main purpose of mentorship is to present career functions, psychosocial functions and knowledge transfer to the protégé (Rynne 2013:142; Cetin et al. 2013:1; Srivastava & Thakur 2013:17). The social capital theory states that when the quality and quantity of an existing relationship in a work environment are conducive to the success of the organisation (Van Staden 2011:41), the mentor and the protégé have a social relationship. The purpose of this theory is to strengthen cooperation, participation, social norms and values and proactive actions. Social capital is the "glue" that keeps sociality, social networks and social support together (Bester 2008:4; Dwiningrum 2013:144; Fuller 2014:132). The value of structured mentorship is found in reaching outcomes, especially by continuous support. The psychosocial theory illuminates the difficult position in which novice leadersfind themselves. Frequently, leaders are expected to give support to colleagues while they themselves are affected by daily problems (Ngamaba 2014:67). The principles of the informal knowledge transfer, social capital and psychosocial support theories are basic to the novice principals' intellectual, social and emotional preparation. The newcomers receive guidance and knowledge, protection and socio-emotional support from an experienced person while advancing in their careers (Erasmus 1993:105; Scandura & Pellegrini 2007:2; Bozeman & Feeney 2010:733; Moorosi 2012:487). Mentorship can therefore be advantageous to the preparation of novice school principals. For the purpose of this qualitative design, the opinions of the novice school principals were obtained in a milieu where their daily routines were the same (Maree 2010:259). Case studies were conducted to study the novice principals' need for support (Creswell 2009:13). Problems that they had to deal with were identified, investigated and described (Zainal 2007:1,2). An analysis of the interaction between the novice school principal and the staff was done to shed light on the issue (Babbie & Mouton 2001:281,282). The research focussed on novice school principals in the Tshwane area in South Africa. Seven novices were purposely selected to represent different cultural and race groups, gender and socio-economic backgrounds (Corbin & Strauss 2008:149). Semi-structured interviews allowed the school principals to express themselves freely (De Vos et al. 2009:296,297). Two observations were made to determine whether the participants did indeed do what they said or whether they acted differently (Corbin & Strauss 2008:29,30). It is expected from novice school principals to have the same knowledge and skills as their predecessors and to master several professional skills in a short time. The knowledge transfer theory states that knowledge takes the shape of convictions about reality and that this knowledge is processed in a given situation and applied to an own world (Geng et al. 2009:124). The findings of this investigation showed that the novice school principal is indeed bombarded by new knowledge and vocational demands, and that there is a lack of sufficient time to process the new knowledge, which can be damaging in the end. The social capital theory, on the other hand, maintains that social networks ought to support the novice school principal (Van Staden 2011:41). According to the literature, the novice school principal begins to feel isolated after his/her appointment because of the absence of supportfrom the staff and community (Lester et al. 2011:413). This investigation showed that it is indeed true. Because of the lack of approval and trust of the staff and community, novice school principals do not have good communication channels. The knowledge transfer, psychosocial and social capital theories, as it was shown by this investigation, present valuable perspectives on the issue of mentorship to novice school principals. Novice school principals, especially in South Africa, do not receive adequate preparation and training, are isolated and receive little or no social support (Boschman et al. 2013:748). They experience a lack of knowledge about how to meet daily demands and to be successful school principals. They need support, formal and informal, in the form of continuous mentorship or a mentorship programme that provides them with clear guidelines before their appointment. In the South African context, there is a need for mentorship in order to enhance the efficiency of school principal leadership and to promote learner achievements. In Suid-Afrika en in die buiteland word skoolhoofde aan die hoë eise en uitdagings van skoolbestuur blootgestel. Vir beginnerskoolhoofde beteken dit dat hulle 'n buitengewoon swaar las moet dra omdat hulle dikwels vanweë onvoldoende voorbereiding en opleiding nie vóór hulle aanstelling met die vereistes van effektiewe skoolbestuur vertroud kon raak nie. Geen ondersteuning in die vorm van formele mentorskap kom in die voorbereiding van beginnerskoolhoofde in Suid-Afrika voor nie, nóg as 'n deel van die skoolleierskapsinduksieprogramme nóg as 'n deel van die ontwikkeling van professionele leierskap (Moorosi 2012:487). Skoolhoofde, veral beginnerskoolhoofde, word daagliks aan emosionele, sosiale en intellektuele eise en uitdagings blootgestel. Die onsekerheid oor hoe om 'n skool suksesvol te bestuur, plaas dikwels emosionele stres op die beginnerskoolhoof, veral omdat daar dikwels na skoolhoofleierskap as die sleutelfaktor in die verbetering van skole verwys word (Wildy & Clarke 2008:269). Daarbenewens moet die beginnerskoolhoof sosiale bande met die leerders, personeel en die gemeenskap smee, maar terselfdertyd beleef hulle isolasie as gevolg van onvoldoende ondersteuning (Crawford 2012:279). Verder word daar van 'n beginnerskoolhoof verwag om 'n sekere mate van onderrig- en bestuurservaring te hê; tog word beginnerskoolhoofde dikwels onvoldoende voorberei en opgelei om 'n skool effektief te bestuur. As 'n mens dus die komplekse rol wat skoolhoofde moet vervul, in ag neem, is dit essensieel dat hulle voldoende voorberei en ondersteun word (Wildy & Clarke 2008:470; Wildy et al 2010:308; Crawford & Cowie 2012:177). Vrae word deurlopend gestel oor hoe skoolhoofde opgelei behoort te word en hoe bevredigend die opleidingsprogramme is, aangesien daar 'n gebrek aan fokus en samehang in baie van die opleidingsprogramme is. Die voorbereiding van beginnerskoolhoofde is van groot belang omdat hulle moet besef dat hulle as skoolhoofde aan hoë verwagtings moet voldoen, prestasiebestuur moet toepas en toenemende openbare verantwoordelikheid moet dra (Van der Westhuizen & VanVuuren 2007:431,432). Deur die jare het daar belangstelling in mentorskap in organisasies voorgekom, veral om demografiese veranderinge, personeelvermindering, samesmelting, toenemende mededinging en die vinnige tegnologiese veranderinge te kan akkommodeer (O'Neill 2005:439), verskynsels wat eie is aan industrieë, die mediese en verpleegterrein en heelwat ander terreine (Wallen et al. 2010:2768; Stamm & Buddeberg-Fischer 2011:489, Driessen et al 2011:438, Jokelainen et al 2011:516). Tog is daar baie min navorsing gedoen oor mentorskap in skoolleierskap en oor die voordele van die verhouding tussen 'n mentor en 'n beginnerskoolhoof met die oog op die professionele ontwikkeling van die beginnerskoolhoof. Sou 'n meer gestruktureerde ondersteuningstelsel nie waardevoller vir beginnerskoolhoofde kon wees in 'n poging om leerderprestasie en die welsyn van die skoolgemeenskap te verhoog, en ook om die eiesoortige uitdagings en eise van skoolbestuur te hanteer nie? (Wildy & Clark 2008:471; Crawford & Cowie 2012:178). Die leemte in navorsing, naamlik om vas te stel of mentorskap beginnerskoolhoofde sou kon ondersteun, word in hierdie artikel ondersoek. Die artikel word soos volg gestruktureer: Eerstens word die konseptuele en teoretiese raamwerk waarbinne die ondersoek plaasgevind het, geskets. Dit word gevolg deur 'n uiteensetting van die navorsingsmetode wat toegepas is. Die bevindings word daarna gelys, gevolg deur 'n bespreking met verwysing na die konseptuele en teoretiese raamwerk. Die artikel sluit af met verskeie aanbevelings. ...a process for the informal transmission of knowledge, social capital, and psychosocial support perceived by the recipient as relevant to work, career, or professional development; mentoring entails informal communication, usually face-to-face and during a sustained period of time, between a person who is perceived to have greater relevant knowledge, wisdom, or experience (the mentor) and a person who is perceived to have less (the protégé). 'n Mentor is 'n ervare volwassene wat 'n minder ervare volwassene bevriend en begelei deur middel van berading, ondersteuning en die voorsiening van ontwikkelingsgeleenthede. ' n Mentor is ook 'n borg, 'n afrigter en beskermheer of -vrou en 'n meerdere (Erasmus 1993:103; Scandura & Pellegrini 2007:2; Bozeman & Feeney 2010:72). Protégés is persone wat hulle loopbane ontwikkel deur rolmodellering, berading en vriendskap. Die potensiële leerareas vir die protégé is kognitiewe en vaardigheidsgebaseerde leer, sosiale netwerke en emosioneel verwante leer (Srivastava & Thakur 2013:18). 'n Verskeidenheid vorms van mentorskap word geïdentifiseer, naamlik veelvuldige mentorskap, spanmentorskap, behoeftegedrewe mentorskap, groeps- en portiermentorskap, asook formele en informele mentorskap (Erasmus 1993:282,292; Scandura & Pellegrini 2007:12,13; Bozeman & Feeney 2010:729,730; Moorosi 2012:491; Nundulall & Dorasamy 2012:131). Scandura en Pellegrini (2007:6) wys op die waarde van verskillende fases in mentorskap, naamlik die kennismakings-, loopbaanontwikkelings-, skeidings- en herdefiniëringsfase. Hierteenoor beskryf Bozeman en Feeney (2010:733) mentorskap as 'n progressie waarin informele kennisoordrag die belangrikste faktor is. Scandura en Pellegrini (2007:1,6) en Erasmus (1993:136,140) ondersteun die belangrikheid van intellektuele ondersteuning. Groot klem word deur skrywers gelê op die seleksie van 'n geskikte mentor omdat die mentor bystand, loopbaanontwikkeling en sielkundige ondersteuning aan die protégé kan verskaf (Scandura & Pellegrini 2007:6; Bozeman & Feeney 2010:728; Frels et al 2013:30). Navorsers is dit eens dat mentorskap van groot waarde is vir ondersteuning, groei, werksbevrediging en die skep van selfvertroue, kwaliteite wat op 'n belegging vir 'n organisasie uitloop. Die mentor en die protégé deel waardes, kennis, ervarings, vaardighede en leierskapstyle (Erasmus 1993:148; Scandura & Pellegrini 2007:7,8; Frick et al 2010:434; Bozeman & Freeny 2010:723; Moorosi 2012:498). Die waarde van 'n dienende skoolhoof se mentorskap vir die voornemende skoolhoof, terwyl laasgenoemde nog 'n assistentskoolhoof is, asook van deurlopende mentorskap, word ook genoem (Mentz et al. 2010:163; Bengtson et al. 2013:155,156). Voortgesette ondersteuning en begeleiding wat deur mentorskap voorsien word as die teorie en praktyk gekombineer word, stel die beginnerskoolhoof in staat om 'n betekenisvolle bydrae tot die stelsel te maak (Van der Westhuizen & Van Vuuren 2007:267; Remy 2009:18; Naidu et al. 2010:97,99; Searby 2010:5,18,19; Woolsey 2010:27). Alhoewel daar geen algemene tydsraamwerk is vir wat as 'n "beginnerskoolhoof bekend staan nie, dui die literatuur aan dat "beginnerskap" oor nagenoeg die eerste drie jaar van 'n skoolhoof se dienstyd strek (Nelson et al 2008:698; Wildy & Clarke 2008:473; Crawford 2012:27,282; Beaudoin et al 2012:8,9,90). Daar word meermale aanvaar dat beginnerskoolhoofde dieselfde kennis en vaardighede as hulle meer ervare kollegas moet hê (Daresh 2006:11,147). Tog is beginnerskoolhoofde emosioneel, sosiaal en intellektueel dikwels onvoorbereid op die eise en uitdagings wat aan hulle gestel word (Skinner 2006:19; Smith 2009:11; Bodger 2011:4,27). Dit is belangrik dat hulle emosionele intelligensie (wat in hulle selfvertroue tot uiting kom), sosiale intelligensie (wat uit hulle samewerkingsvermoë en groepsbestuursvaardighede duidelik word) en intellektuele intelligensie (waarvan hulle bevoegdhede 'n aanduiding is) die fondament moet vorm vir hulle voorbereiding om as hoof van 'n skool op te tree (Lee et al. 2013:1,2; Dwiningrum 2013:144). Die probleem is dat die nodige ondersteuning dikwels ontbreek om hierdie drie "pilare" staande te laat bly in die eerste paar jaar van skoolhoofde se dienstydperk. Gevolglik gaan hulle gebuk onder baie stres, emosionele, psigologiese en sosiale probleme (Cheung & Walker 2006:406), soos hieronder aangedui word. Dit kom voor asof die beginnerskoolhoof die eerste paar jaar 'n stryd om emosionele oorlewing voer en skaars in staat is om in die belange van sy of haar skool op te gaan (Cheung & Walker 2006:390). Die skoolhoof is die enigste persoon wat die spesifieke rol van skoolhoof moet vervul; daar is geen ander personeellid wat dieselfde probleme en uitdagings in die gesig staar nie en dus niemand met wie hy of sy hulle kan bespreek nie (Smith 2009:11). In hulle daaglikse roetine moet beginnerskoolhoofde gevolglik gekompliseerde probleme in isolasie oplos, boonop in 'n kort rukkie met gedurige onderbrekings. Dikwels is beginnerskoolhoofde onbewus van die afsondering wat gaan volg wanneer hulle as beginnerskoolhoofde aangestel word. Omdat hulle tot dusver in die rol van 'n personeellid in 'n groep met dieselfde belange gefunksioneer het, is dit buitengewoon moeilik om by hierdie geïsoleerdheid aan te pas. Daar is ook geen ondersteuning wat rigting bied aan hulle toekomstige optrede nie, geen sielkundige ondersteuning, geen ondersteuning om die proses van verandering te hanteer nie en om hulle rol as beginnerskoolhoofde te verstaan nie (Remy 2009:29; Kim 2010:22; Lester et al. 2011:413). Daar word van die beginnerskoolhoof verwag om goeie sosiale kontak met bestuursliggaamrade en -unies te handhaaf (Stevenson 2008:3). Dit moet geskied te midde van probleme met die vorige skoolhoof se benadering tot die tradisie, praktyke en bestuurstyle, veral as verandering ter sprake kom en as die personeel gewoond is aan die werkskultuur en -roetine van die voorganger. Om die leiersrol by die vorige skoolhoof oor te neem, skep eiesoortige probleme. Bloot om die nuwe titel wat aan hulle toegedig word, te aanvaar, is moeilik, veral omdat hulle gewoonlik 'n afstand tussen hulle en die personeel moet hou (Spillane & Lee 2013:2,5,6). 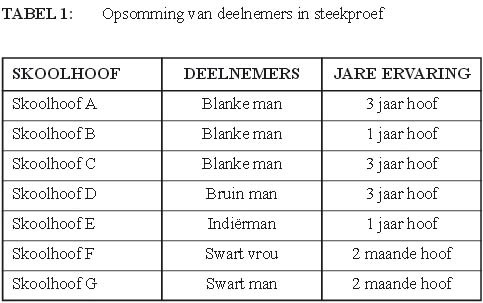 Meesal word skoolhoofde aan hulle eie lot oorgelaat in 'n fase waartydens hulle nuwe roetines, nuwe verhoudings en nuwe verantwoordelikhede beleef (Bodger 2011:4,27). Stevenson (2008:32,67) is van mening dat beginnerskoolhoofde dikwels twyfel oor wie hulle is en hoe hulle hul gesag doeltreffend moet gebruik. Die gemeenskap is voorts soms geneig om beginnerskoolhoofde met die vorige skoolhoof te vergelyk. Hulle plaas hulle onder die vergrootglas, veral as hulle aangestel word in 'n pos wat baie jare deur die vorige skoolhoof beklee is, en die nuweling se bestuurstyl aansienlik van dié van sy voorganger verskil (Sackney & Walker 2006:345,348). Die gemeenskap koester gewoonlik hoë verwagtinge van die beginnerskoolhoof. Hulle moet die sleutel tot 'n suksesvolle skool wees, op alle terreine uitblink en 'n goeie indruk maak, maar dikwels sonder die nodige sosiale ondersteuning deur die ouers (Wolhuter 2005:121-122). Die beginnerskoolhoof moet verskeie professionele vaardighede in 'n baie kort rukkie bemeester. Hierdie vaardighede sluit onder andere die vermoë in om administratiewe werk te prioritiseer, leierskap te vestig, interpersoonlike vaardighede te ontwikkel, verhoudings voort te sit, kontak met leerders te maak, kommunikasie te ontwikkel, leerderdissipline te handhaaf en nog steeds 'n sin vir humor onder spanning te behou (Barton 2009:39,40). Beginners besef gou hoe min beheer hulle het oor sake soos hulle verantwoordelikheid vir die personeel, vir programme en hulpbronne wat jongmense se lewens kan beïnvloed. Dit word vir hulle duidelik dat hulle vir alles op die skoolterrein verantwoordelik is en dat daar van hulle verwag word om alles te herstel sodat effektiewe leer kan plaasvind (Stevenson 2008:32,67). Daarbenewens moet die beginnerskoolhoof 'n verskeidenheid leierskapsvorme identifiseer, maar weer eens sonder dat daar mentors, afrigters of persone is om hulle by te staan en op te lei (Bodger 2011:20). Die gebrek aan vaardighede om doeltreffend te delegeer en tyd effektief te benut, maak hulle baiekeer blind vir die groter prentjie (Skinner 2006:19). Beginnerskoolhoofde faal dikwels as leiers omdat interpersoonlike vaardighede,toeganklikheid vir nuwe of ander idees en betroubaarheid en inisiatief by hulle afwesig is en omdat hulle weier om hulle foute te erken (Searby 2010:6). Nieteenstaande hierdie ongewenste situasie word beginnerskoolhoofde steeds aangestel sonder dat hulle vir die pos bemagtig is. Beginnerskoolhoofde het nie altyd die bevoegdhede om by die veranderde omgewing van die nuwe skool en die nuwe verantwoordelikhede aan te pas nie (Barton 2009:40). Hulle word dikwels aangestel op grond van hulle ondervinding as onderwysers en nie as skoolhoofde nie, die onderhoude wat met hulle gevoer word, 'n curriculum vitae en suksesvolle onderrig (Van der Westhuizen 2005:4). Aanstellings word voorts gedoen sonder dat die voornemende skoolhoofde die nodige opleiding, voorbereiding én ondersteuning ontvang wat spesifiek op skoolhoofde afgestem is (Onguko et al 2008:716). What new principals learn must be based upon best practice and current research. If not, new principals will form approaches and habits that will be difficult to unlearn or rethink. In addition, if principals make serious mistakes in their first year, they may suffer the fallout for many years to come. Principals need standards that articulate the professional knowledge, skills, dispositions and performance they need to know and be able to do to be effective. Daar bestaan wel wêreldwyd 'n aantal opleidingsprogramme ter voorbereiding van beginnerskoolhoofde, byvoorbeeld die New York City Leadership Academy Aspiring Principals-program (NYCLAAP), die Nederlandse Magistrum-program, Wichita State University Program for the Preparation of Novice Principals en die Britse New Vision Programme (Ballet et al. 2000:3,4,8,9; Hale & Moorman 2003:11; Olson 2007:6,7). Tog is hierdie programme onvoldoende; dus word mentorskap as 'n moontlike oplossing vir beginnerskoolhoofde voorgestel. Die vraag kan gestel word waarom mentorskap beginnerskoolhoofde juis sal bevoordeel. Die antwoord is opgesluit in drie teorieë wat lig kan werp op die verskillende fasette van mentorskap aan beginnerskoolhoofde, te wete die psigososiale teorie, die sosiale kapitaalteorie en kennisoordragteorie. Hierdie perspektiewe word vervolgens kortliks toegelig. Die waarde van gestruktureerde mentorskap lê in die bereiking van uitkomste, veral wanneer daar voortdurende ondersteuning is. Die psigososiale teorie belig die moeilike posisie waarin (pas aangestelde) leiers hulle bevind: daar word dikwels van leiers verwag om ondersteuning aan hulle kollegas te bied terwyl hulle self met hulle eie daaglikse probleme worstel (Ngamaba 2014:67). Studies het getoon dat nuwe vorme van indiensneming psigososiale probleme veroorsaak as gevolg van die werksvereistes en gebrek aan sosiale ondersteuning (Boschman et al 2013:748). Dit is om hierdie rede dat mentorskap so belangrik is; wanneer die mentor en protégé meer tyd aan mekaar bestee, ontwikkel mentorskap in 'n langdurige, stabiele en emosionele verhouding, wat veral die beoogde doelwitte van die oordra van kennis en vaardighede bevorder (Martin & Sifers 2012:940-942). Barnetz en Feigin (2012:467) sluit hierby aan met hulle mening dat suksesvolle mentorskap 'n balans tussen plesier en belangstelling aan die een kant, en struktuur, ontwikkeling en bydrae aan die ander kant is. Daarbenewens is die gevolg daarvan 'n positiewe, sosiale en professionele verhouding, en uiteindelik werksbevrediging (Çetin et al 2013:20). 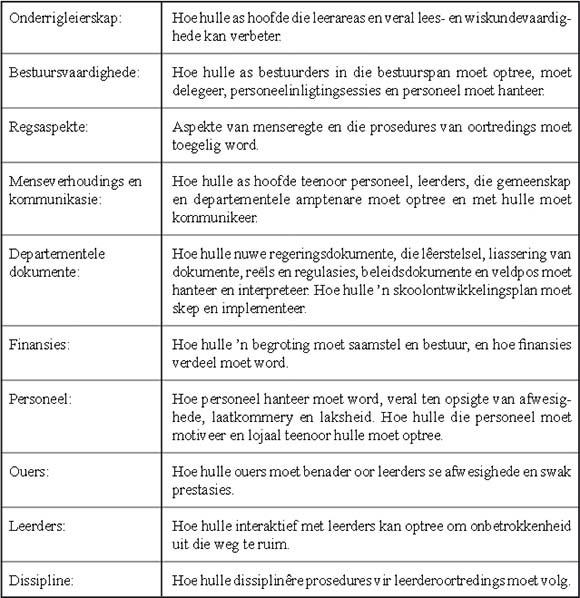 Die sosiale kapitaalteorie stel dat waar die kwaliteit en kwantiteit van 'n bestaande verhouding in 'n werksomgewing die sukses van 'n organisasie bevorder (Van Staden 2011:41), die mentor en protégé in 'n sosiale verhouding tot mekaar staan. Sosiale kapitaal verwys na die sosiale bande of netwerke, binne die werksomgewing én die gemeenskap, wat deelnemers in staat stel om saam te werk (Van Staden 2011:70; Lee et al. 2013:1). Die doel van sosiale kapitaalvorming is om onderlinge samewerking, deelname, sosiale norme en waardes en proaktiewe aksies te versterk. Sosiale kapitaal is die "gom" wat sosialiteit, sosiale netwerke en sosiale ondersteuning bymekaar hou (Bester 2008:4; Dwiningrum 2013:144; Fuller 2014:132). Deur sosiale netwerke, verhoudings en gemeenskaps- en ouerbetrokkenheid word kennis verwerf en gedeelde waardes ontwikkel, wat vertroue skep en vir die gemeenskap waardevol is (Fuller 2014:133,134). Die sosiale verhouding tussen mentor en protégé is 'n middel tot voortdurende leer vir die protégé (Srivastava & Thakur 2013:18). 'n Organisasie soos 'n skool bied die ideale geleentheid om hierdie verhouding te versterk deurdat die protégé die vaardighede en kennis op 'n sosiale wyse bekom. Die mentor help die protégé om die nuwe omgewing te leer ken. Dit lei tot beter interaktiewe aanpassing, gesindhede en werksprestasie om die doelwitte suksesvol te bereik. Omdat ondervinding dikwels deur waarneming en nabootsing van ander mense opgedoen word, bied die sosiale verhouding tussen die mentor en die protégé die geleentheid om meer oor die skool te leer omdat die mentor as die rolmodel optree. Die gevolg is beter effektiwiteit omdat die protégé die nagevolge van hulle aksies binne die werksomstandighede beter verstaan (Yang et al 2012:409,410; Martin & Sifers 2012:940; Zhuan et al. 2013:37; Çetin et al. 2013:5). Die beginsel van die kennisoordragteorie is dat kennis dikwels die vorm van oortuigings oor die werklikheid aanneem (Geng et al 2009:124). 'n Gegewe situasie sal die soort kennis wat oorgedra moet word én die verwerking van daardie kennis vergestalt (Nokes 2009:2). Die hoofdoel van mentorskap is om loopbaanfunksies, psigososiale funksies en kennisoordrag aan die protégé te bied (Rynne 2013:142; Cetin et al 2013:1; Srivastava & Thakur 2013:17). Daar kan in die behoeftes van 'n persoon (protégé) voorsien word deur samewerking, veral as dit doelwitgeoriënteer is (Hall 2011:281,282). Die doeltreffende oordrag van kennis vind plaas deur sosiale verandering, ook in 'n organisasie. Die hoeveelheid gestruktureerde kennis van die deskundige is belangriker, ryker en waardevoller vir die werklikheid as dié van die beginner (Geng et al 2009:124; Bozeman & Feeney 2010:724,732; Alami & De Arriaga 2013:44). Die wêreld is sosiaal gekonstrueer deur middel van verskillende vorme van kennis, van alledaagse kennis tot wetenskaplike en kulturele kennis as verskillende maniere om 'n eie wêreld te skep (Flick 2009:77). Die beginnerskoolhoof staan voor die uitdaging om die sosiaal gekonstrueerde kennis van die mentor te internaliseer en uiteindelik sy of haar eie te maak. Die beginsels van die informele kennisoordrag-, sosiale kapitaal- en psigososiale onder-steuningsteorieë hou ook verband met die intellektuele, sosiale en emosionele voorbereiding van beginnerskoolhoofde. Hulle ontvang begeleiding en kennis van 'n ervare persoon, geniet hulle beskerming en word sosio-emosioneel ondersteun terwyl hulle in hulle beroep vorder (Erasmus 1993:105; Scandura & Pellegrini 2007:2; Bozeman & Feeney 2010:733; Moorosi 2012:487). Dit is om hierdie rede dat mentorskap voordelig vir die voorbereiding van beginnerskoolhoofde kan wees. Van der Westhuizen en Van Vuuren (2007:262) is oortuig dat mentorskap in die beginjare van die beginnerskoolhoof se aanstelling geïmplementeer moet word as 'n bykomende strategie vir die ontwikkeling van die beginnerskoolhoof, omdat mentorskap essensieel vir die oorgang van die klaskamer na hoofskap is. Die vraag is hoe pas aangestelde skoolhoofde ondersteun kan word om die uitdagings met behulp van mentorskap te bowe te kom (Creswell 2009:8). 'n Analise van die daaglikse lewens van die beginnerskoolhoofde en 'n poging om die betekenis van hulle daaglikse ervarings te bepaal, was die kern van die studie waaroor daar in die volgende afdeling gerapporteer word (Flick 2009:77; Corbin & Strauss 2008:10). Die kwalitatiewe navorsingsontwerp is die gepaste navorsingsontwerp waarmee die probleem van die beginnerskoolhoofde ondersoek is en 'n gedetailleerde begrip van 'n sentrale probleem verkry is (Creswell 2009:16). 'n Diepliggende insig in die persepsie en belewing van die beginnerskoolhoofde in 'n milieu waar hulle roetine elke dag min of meer dieselfde is, is verkry (Maree 2010:259) deur die deelnemers en hulle interaksie in die konteks van hulle situasie te bestudeer met die doel om te verstaan hoe hulle reageer op die eise en uitdagings wat daagliks opduik (Babbie & Mouton 2001:281,282; Merriam 2002:5; Zainal 2007:1,2; Creswell 2009:13). Die semi-gestruktureerde onderhoude tydens die gevallestudie het die skoolhoofde toegelaat om hulle vrylik in hulle eie taal uit te druk (De Vos et al 2009:296,297) en deur die waarnemings wat die onderhoude opgevolg het, kon die soort ondersteuning wat die skoolhoofde graag wou hê, duidelik vasgestel word (Corbin & Strauss 2008:29,30). Die vrae tydens die onderhoude het hoofsaaklik oor die eise en uitdagings wat aan die beginnerskoolhoofde gestel word, gegaan; verder is aandag gegee aan die ondersteuning wat hulle ontvang en graag wil ontvang; en laastens is daar vrae gestel oor hulle sienings van mentorskap en mentorskapsprogramme. Etiese klaring vir die ondersoek is deur 'n universiteit gegee. Die Departement van Onderwys van Gauteng het voorts toestemming gegee dat die navorsing in die Tshwane-omgewing uitgevoer mag word. Daar is met die skoolhoofde in aanraking gekom sodat die navorser 'n aanduiding kon kry van watter skoolhoofde beskikbaar was en gewillig sou wees om aan die navorsing deel te neem. Die Departement se skriftelike toestemming is aan die skoolhoofde oorhandig sodra hulle aangedui het dat hulle bereid sou wees om aan die navorsing deel te neem en dat die navorser hulle skole as 'n navorsingsterrein kon gebruik. Versekering is gegee dat vertroulikheid en anonimiteit te alle tye gerespekteer sou word (Mason 2002:80). In hierdie gevallestudie is sewe skoolhoofde doelgerig geselekteer om verskillende kulturele en rassegroepe, geslags- en sosio-ekonomiese agtergronde te verteenwoordig. Die navorsing was toegespits op beginnerskoolhoofde in die Tshwane-omgewing, Suid-Afrika. Pretoria bied 'n diversiteit van beginnerskoolhoofde. Die hoofde is oor 'n wye geografiese gebied geselekteer (Corbin & Strauss 2008:149). Geslag, nasionaliteit en taal is in die seleksie in berekening gebring. Die skole is versprei oor die hele Tshwane-gebied, tot sover as Soshanguve en Hammanskraal. Die deelnemers word in die tabel hieronder aangedui. Die onderhoude is getranskribeer en deur 'n diskoersanalise is temas en subtemas geïdentifiseer. Om seker te maak dat die temas korrek is, is die data herhaaldelik gelees. Die waarnemings is deur middel van kriteria in 'n tabel vasgelê. Deur die onderhoude én waarnemings kon geloofwaardigheid verseker word omdat die inligting wat tydens die waarneming ingesamel is, vergelyk is met die inligting wat deur die beginnerskoolhoofde tydens die vroeëre onderhoude verstrek is (Merriam 2002:215; Creswell 2009:239, 245). Die interpretasie van die data het vier oorkoepelende temas geïdentifiseer, naamlik probleme rakende emosionele ondersteuning, sosiale ondersteuning, intellektuele vaardighede en mentorskap. Ek het 'n wanpersepsie gehad van wat die hoofpos behels en was teleurgesteld in myself omdat ek gevoel het dat ek onbevoeg vir die pos was. Die vroeë ouderdom waarop ek aangestel is, het ook bygedra tot my onsekerheid aangesien my bestuurspan heelwat ouer as ek was. Skoolhoof C het verder gevoel dat hy in "wedywering" met die vorige skoolhoof staan en asof hy deurentyd met die vorige hoof vergelyk word, en dit het emosionele spanning tot gevolg gehad. Die algemene gevoel onder al die deelnemers was dat dit vir hulle moeilik was om vanaf die posisie van 'n personeellid na die pos van 'n hoof oor te gaan en dat hulle nie meer die vrymoedigheid gehad het om met personeel te kommunikeer soos wat hulle gehad het toe hulle personeellede was nie. Op hierdie stadium, administratief, definitief. Ek kom nie... ek kom amper nie by my personeel uit vir klasbesoek nie. Administratief vir seker, jy sien mos hoe lyk my tafel, ek kom nie voor nie. Elke kort-kort kom daar 'n nuwe dokument van die regering deur uit die Gazette, sê dit en dit en dit het verander. Dan lees jy dit maar self op... die interpretasie van beleidsdokumente. Skoolhoof F het haar kommer uitgespreek oor dokumentasie wat van die departement af kom en geen aanduiding het waar dit geliasseer moet word nie. Die ouens wat aansoek doen, selfs vir die adjunk-hoofpos, het nie bestuurservaring nie. Goed, hulle weet van funksie, maar hulle weet nie wat is die basiese stappe nie, die siklusse, funksies van bestuur, mens het nie 'n idee daarvan en dit kan ek verstaan hoekom baie goed nie gebeur soos wat dit moet gebeur nie want die ouens weet nie hoe om dit nou regtig te doen nie. Wat dit moeilik maak, is jy gaan studeer onderwysbestuur, maar alles rondom die departement, al hierdie pos wat jy van hulle af kry, het jy absoluut geen opleiding. Jy't geen opleiding en geen ervaring; dan kom hier 'n dokument soos gister wat sê, volgende week moet jou skool se [School Improvement Plan] in wees, geen opleiding daarin. Met ander woorde, uit die perspektief van die departement af, het ons maar geweldig min opleiding. 'n Mentor is geweldig belangrik... ek dink die mentorskapprogram moet jou ondersteun, daar's baie dinge wat jy nie van regte weet nie (skoolhoof C). ... ek dink dis beslis 'n behoefte en wat u sê, 'n mentor; mens moet kyk daarna (skoolhoof B). Ek dink dat ek my mentor kan gebruik wanneer ek hulp nodig het, wanneer ek nie iets verstaan nie, kan ek haar kontak (skoolhoof F). [Mentors wat weet hoe om die dinge die beste te doen, kan verwelkom word op die spesifieke gebiede waarop hulle hul toegespits het] (skoolhoof G). ... die mentors moet dan net bestaan uit oudskoolhoofde... veral 'n mentor wat ervaring het, want kyk, ervaring is 'n goeie leermeester (skoolhoof D). Verder het die skoolhoofde aangedui dat die mentor hulle deurlopend moet bystaan, hulle soms persoonlik moet besoek en gereeld beskikbaar moet wees, veral as 'n dringende saak opduik. • mentors of persone moet in onderwys opgelei wees. Ons het 'n hele dag gespandeer by 'n kamp, 'n terrein en by daardie kampterrein is ons toe nou ingelig van die waarde van mentorskap, hoe dit gaan werk en so meer. Ons was eerder liewer heeldag getrakteer en ek was verskriklik gefrustreerd gewees want... ons tyd is verkoos... Ons is toe nou voorgestel aan die mentors en onmiddellik het ek gevra, Meneer, as dit die mentors is, het hulle opleiding as skoolhoofde en die antwoord wat ek gekry het, was, nee, maar hulle is in die sakewêreld. Toe sê ek, maar Meneer, ek het mos nou nie vir my nou kom appels met pere vergelyk nie, die twee dinge werk nie saam nie. Maar jy kan nie 'n mentor wat in die sakewêreld is, dan moet jy jou ervaring met my kom deel want dit is nie dieselfde nie. ... in die sakewêreld werk dit anders as die onderwys. Ek meen, selfs as 'n mentor, kyk, 'n bestuurder, as jy 'n bestuurder is in die sakewêreld en jy is 'n bestuurder op skool dan is dit nie dieselfde nie in die sin dat op skool moet jy half soebat, maar in die sakewêreld waarjy verantwoordelik is vir die betaling van persone soebatjy nie (skoolhoof D). ... dit was so drie jaar terug wat hulle so 'n programmetjie aangebied het vir 'n dag, was net vir 'n dag en ek kan onthou een van ons mans wat toe departementshoof geword het, in die vorige kwartaal was daar en toe hy terugkom toe vra ek vir hom, het jy iets geleer? Toe sê hy nee, hy't nie regtig iets geleer, want hulle het hulle gebombardeer; dis te veel inligting vir een dag, dit moet trapsgewys, kontinue moet hulle een aspek vat en daaraan aandag gee en dalk in die volgende maand weer 'n volgende een, so. Hulle het vir hulle probeer in een dag al die inligting gee en dis onmoontlik, jy kan niks leer nie. Die bevindinge van hierdie ondersoek toon dat die beginnerskoolhoof inderdaad gebombardeer word met nuwe kennis en beroepseise, en dat daar dikwels nie voldoende tyd is om die nuwe kennis te verwerk nie. Dit kan tot nadelige langtermyn gevolge lei. Die sosiale kapitaalteorie, aan die ander kant, stel dat sosiale netwerke ondersteuning aan die beginnerskoolhoof behoort te bied. Volgens die literatuur ervaar beginnerskoolhoofde egter dikwels 'n gevoel van isolasie ná hulle aanstelling en kry hulle meermale geen ondersteuning van die personeel en die gemeenskap nie. Hierdie ondersoek het getoon dat dit inderdaad die geval is. Hoofde het weens 'n gebrek aan goedkeuring en vertroue van die personeel en gemeenskap geen goeie kommunikasiekanale gehad nie. Die kennisoordrag-, psigososiale en sosiale kapitaalteorieë, só het hierdie ondersoek getoon, bied 'n waardevolle insig in die kwessie van mentorskap vir beginnerskoolhoofde. Beginnerskoolhoofde, veral Suid-Afrikaanse beginnerskoolhoofde, ontvang nie voldoende voorbereiding en opleiding nie, en daarom vind hulle dit moeilik om die eise van hul nuwe betrekking te hanteer. Hulle word voorts geïsoleer en ontvang weinig of geen sosiale ondersteuning nie. Hulle ervaar 'n gebrek aan kennis van hoe om die daaglikse eise te bowe te kom én om 'n suksesvolle skoolhoof te wees. Daar bestaan 'n groot behoefte aan ondersteuning, formeel én informeel, in die vorm van 'n mentor of 'n mentorskapsprogram. As 'n mentor of 'n mentor-skapsprogram in die voorbereiding of opleiding van voornemende skoolhoofde ingestel sou word, moet daar duidelike riglyne vir die program wees en behoort die skoolhoofde ná deurloping van die program verder ondersteun te word voordat hulle aangestel word. Die ondersteuning moet tydens die eerste drie jaar ná die aanstelling as skoolhoof voortgesit word. Daar is in die Suid-Afrikaanse konteks 'n behoefte aan mentorskap ten einde die doeltreffendheid van skoolhoof-leierskap te verhoog en leerderprestasie te bevorder. 'n Paar aanbevelings vloei uit hierdie studie voort. 'n Mentor behoort vir elke beginnerskool-hoof aangestel te word om hulle tydens die eerste paar jaar ná hulle aanstelling by te staan. Die mentor behoort 'n ervare skoolhoof te wees wat goed bekend is met 'n betrokke skoolomgewing. Verder moet die mentor 'n skakelpersoon tussen die beginnerskoolhoof en die Departement van Onderwys wees om die skoolhoof met departementele dokumente en verwante inligting te ondersteun. 'n Mentorskapsprogram sal van groot waarde wees indien dit uit fases bestaan, waar fase een met die aanstelling van die beginnerskoolhoof begin, fase twee in die eerste jaar ná die aanstelling voortgesit word en fase drie uit gereelde ondersteuning bestaan. Dit sou van groot waarde wees as die mentorskapsprogramme ook aan departementshoofde en adjunkhoofde beskikbaar gestel word sodat hulle deeglik voorberei kan word vir die taak van skoolhoof. Leentjie van Jaarsveld is dosent in Onder-wysbestuursleierskap in die Fakulteit Opvoedingswetenskappe van die Noordwes-Universiteit se Potchefstroomkampus. Sy was vir die grootste gedeelte van haar onderwysloopbaan verbonde aan Hoërskool Generaal Hertzog in Witbank. Sy voltooi haar BEdHonneurs in 2009, en die MEd in 2013. Gedurende 2012 en 2013 was sy verbonde aan die Universiteit van Pretoria. en sedert November 2013 is sy permanent aangestel by die NWU se Potchefstroomkampus. Tans is sy besig met haar PhD in Onderwysbestuursleierskap. Haar navorsingsfokus is benaderings tot skoolhoof-leierskap. Leentjie van Jaarsveld is a lecturer in Education Management Leadership in the faculty of Education Sciences at North West University. Potchef-stroom campus. She was a teacher for many years at Hoërskool Generaal Hertzog. Witbank. She completed her BEdHonours in 2009, and the MEd in 2013. During 2012 and 2013 she was appointed as part time lecturer at the University of Pretoria. Since November 2013 she has been a fulltime lecturer at the NWU, Potchefstroom campus. Currently, she is working on a PhD in Education Mangement leadership, and her research focus is school leadership approaches. Kobus Mentz is professor in Onderwysbestuurs-leierskap en direkteur van die Skool vir Opvoed-kundestudies in die Fakulteit Opvoedings-wetenskappe van die Noordwes-Universiteit se Potchefstroomkampus. Sy voorgraadse studies het hy aan die Universiteit Pretoria en die Randse Afrikaanse Universiteit voltooi, en sy PhD in 1991 aan die destydse Potchefstroomse Universiteit vir Christelike Hoër Onderwys. Hy was vir 'n aantal jare Wiskunde-onderwyser aan twee hoërskole voordat hy in 1985 by die destydse PU vir CHO aangestel is. Sy navorsingsfokus is die skool as organisasie en die voorbereiding van skool-hoofde. Hy het al meer as dertig artikels in geak-krediteerde vaktydskrifte gepubliseer en talle nagraadse studente begelei. Sy kwalifikasies sluit in: BA, BEd, MEd, DEd, Diploma in Tersiêre Onderwys, HOD (N). Kobus Mentz is professor of Education Management Leadership and director of the School for Education studies in the faculty of Education Sciences at the North West University, Potchef-stroom campus. He completed his studies at the University of Pretoria and the Rand Afrikaans University, and in 1991 he obtained his PhD at the the Potchefstroom University for Christian Higher Education. He was a Mathematics teacher at two secondary schools for a few years before he was appointed at the PU for CHO. His research focus is the school as organisation and the preparation of school principals. He has published more than thirty articles in accredited journals and has been study leader for a number of students. His qualifications are: BA, BEd, MEd, DEd, Diploma in Tertiary Education, HOD (N). Branwen Henry Challens voltooi in 1989 sy BA-graad met Sielkunde en Geskiedenis as hoofvakke. In 1990 behaal hy die Hoër Onderwys-diploma, en begin daarna sy onderwysloopbaan by Alabama Secondary School. Gedurende 1996 en 1997 neem hy waar as departementshoof, en in 2000 word hy as adjunk-hoof van Alabama Secondary School aangestel. In Januarie 2003, op die ouderdom van 34 jaar, is Branwen as hoof van Klerksdorp Secondary School aangestel, 'n pos wat hy beklee vir sewe en 'n half jaar. Op 1 Julie 2010 word hy as senior lektor in Onderwys-bestuursleierskap by die NWU se Potchef-stroomkampus aangestel. Hy was reeds hulpstudie-leier van een MEd-student, en is tans studieleier van een PhD- en twee MEd-studente. Hy het reeds nasionaal en internasionaal gepubliseer en het artikels vir ses verskillende joernale geresenseer. Hy behaal die volgende kwalifikasies: BEd. (1996); MEd. (2000); Sertifikaat in Menslike Hulpbronnen (2001); Diploma in Skoolbestuur (2004); PhD (2008); BTh. (2008); en 'n Sertifikaat in Finansiële Bestuur (2009). Branwen Henry Challens completed his BA-degree In 1989, majoring in Psychology and History. In 1990 he completed his Higher Diploma in Education (HDE) and started his teaching career at Alabama Secondary School. In 1996 and 1997 he acted as Head of Department and in 2000 he was appointed Deputy Principal of Alabama Secondary School. At the age of 34 years, he was appointed as Principal of Klerksdorp Secondary School in January 2003; a position he held for 7 and a half years till 30 June 2010. On 1 July 2010 he was appointed in his current position, Senior Lecturer at the North West University, Potchef-stroomcampus. He is lecturer in Education Management and Leadership. He has already delivered one MEd student as assistant promoter, and is currently the promoter of one PhD and two Masters' students. He has presented International and national papers and reviewed papers for six different Journals. He obtained the following qualifications: BEd. (1996); MEd. (2000); Certificate in Human Resource Management (2001); Diploma in School Management (2004); PhD (2008); BTh. (2008); and a Certificate in Financial Management (2009). 1 [ ] Verteenwoordig aanhalings uit Engels in Afrikaans vertaal.